NATURAL HABITAT AND PREFERRED SITE: Wide range of native habitat in Texas including most of the eastern half of the state, also in the calcarious hillsides of west Texas. It adapts to a wide range of soils in Texas and sun exposures. It is an excellent choice for formal landscape projects as well as natural settings. IDENTIFICATION INFORMATION: It is a small to medium growing tree that is full and spreading in full sun but tends to be upright and more open as an understory in the shade. 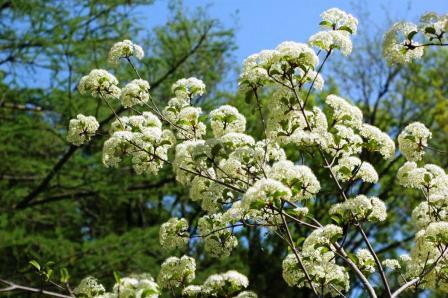 Rusty blackhaw viburnum has clusters of white flowers in the spring, blue-black berries in the late summer into fall, sometimes forms thickets but usually appears as single plants. 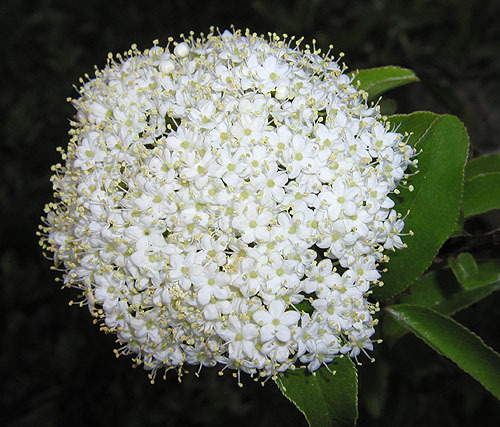 FLOWERS AND FRUIT: Flowers form in clusters in mid spring after the leaves start to unfold. They are white, five lobed, highly fragrant ¼ inch wide. Fruit ripens in the fall in clusters of dark blue football-shaped, edible, fleshy drupes about 1/3 to ½ inch long with a flattened stone-like seed within. Fruit pulp is sweet and edible with a raisin-like taste. BARK: Smooth gray at first, darkens to almost black with a distinctive blotchy or checkered appearance with age. 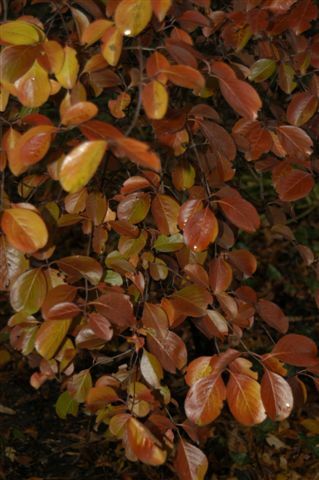 FOLIAGE: Leaves are about 3 inches long, glossy, dark green in the summer, opposite, deciduous and beautiful pink to red to dark purple in the fall. They are hairy beneath. CULTURE: Rusty blackhaw viburnum is an easy to grow ornamental tree that should be used much more. Responds well to fertilizer and irrigation but is quite drought tolerant. PROBLEMS: Very few pest infestations. This is practically a maintenance-free tree. PROPAGATION: Easily grown by seed or by semi-hardwood cuttings taken in the summer or early fall. 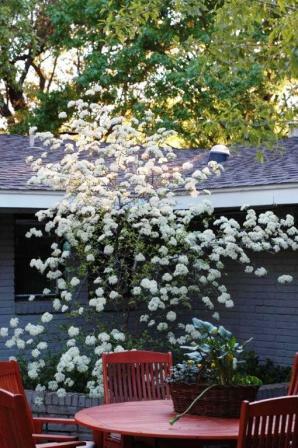 INSIGHT: This is one of my favorite small trees and should be planted considerably more in Texas both in sun and shade. It is beautiful from spring to hard frost in the late fall. 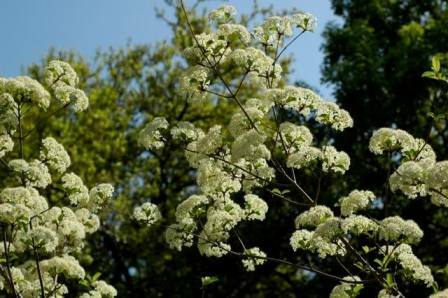 Another good choice is arrow-wood viburnum (Viburnum dentatum), also known as southern arrow wood, mealy tree, with-rod, with-wood, has triangular, serrated leaves, will grow in a range of soils, although it prefers sandy loams and does well in full sun to filtered light. It grows to a height of 8 to 15 feet, has clusters of small white flowers in the spring followed by bluish-black droops late summer into fall. 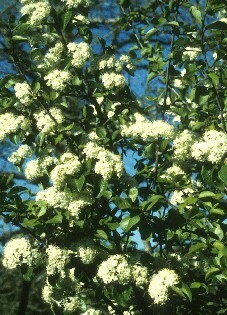 HABIT: Shrubby tree, glossy leaves, white flower clusters in spring, reddish fall color, blue- black berries in late summer. Can grow to 40 feet. CULTURE: Easy to grow in most soils, extremely drought tolerant. 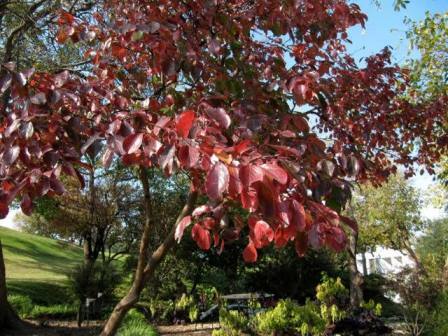 USES: Specimen garden tree, understory tree, background mass planting. NOTES: Great shrub or little tree. Native to Texas and Oklahoma.